"Karigan G’ladheon, running away from school, is traveling through a deep forest when a galloping horse pounds up to her, its rider impaled by two black-shafted arrows. 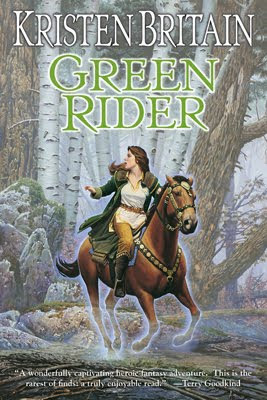 With his dying breath, he tells her he is a Green Rider, one of the magical messengers of the King. Before he dies, he makes Karigan swear to deliver the message he’s carrying, and gives her his green coat, with the symbolic brooch of his office. Pursued by unknown assassins, following a path only her horse seems to know, Karigan becomes a legendary Green Rider—for when given to the right person, a Rider’s brooch awakens the magic inside…." A fantasy book.. I like that! Here is my A-Z Wednesday post! I think I'll add this to my TBR list. Sounds very good!